Happy Halloween! And I hope everyone has a fun and safe one. Fuzz is looking forward to trick-or-treating with her friends and a group of Russian exchange students. Meanwhile, I’ll be hiding inside eating Halloween Chocolate Layer Cake with Todd. I served this same cake at a party last night, but Todd didn’t get any so I “had to” make it again today. That of course was an excuse to try this new chocolate sour cream frosting which I found on Epicurious. It’s good! And this cake is an old one that is always good. The cake works best with natural cocoa powder rather than Dutch. Regular Hershey’s cocoa powder works great, but Scharffen Berger is even better. Also, I made this one in two 9 inch pans. It’s not a super tall cake, but it’s not exactly stubby. In fact, it’s just about the right size for surrounding with Kit Kats and filling with M&Ms if you’re in the mood for one of those Kit Kat cakes. Update: I really need to change the name of this cake. First of all, it’s not just for Halloween. And second, the recipe works perfectly as a sheet cake. 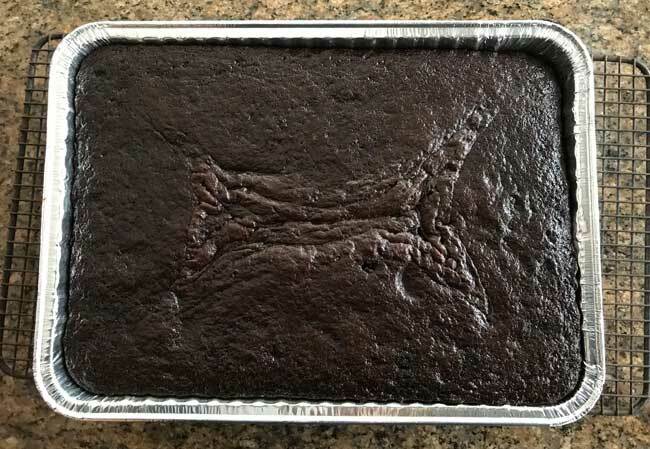 To make it as a 9×13 inch cake, follow the recipe as written but bake in a 9×13 inch pan for about 50 minutes at 300. 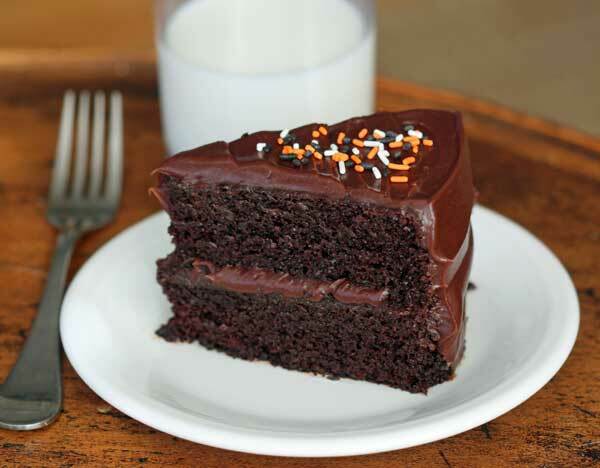 Mmmm, there’s nothing like a piece of chocolate cake with chocolate frosting, especially wih a tried and true recipe! That’s a great question. Normally I would, but last night I left half the cake out under a glass dome and it’s just fine. The icing will be softer, but it didn’t seep all over the place. Now I really want to try this recipe and the Portillo’s Copycat Cake so I can make a comparison!